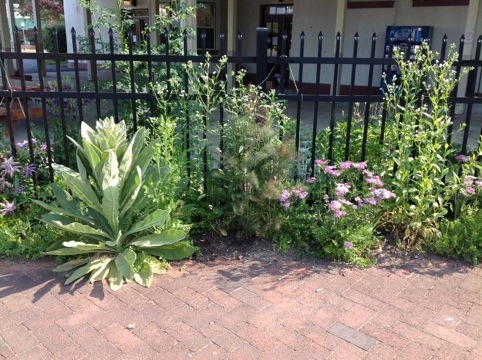 Imagine my delight when I pulled into my bank’s parking lot this morning, in Saratoga to discover a fully established and tasteful habitat garden! The garden is long, perhaps 100 feet or more, narrow and optimized with plants to attract birds and plants to attract butterflies. Saratoga Springs, NY is special this way: you never know what tantalizing herbacious surprises lie in unexpected pockets. Mullein (pictured left in the photo) is a bold choice, and one I’m proud of the designer for making. Lots of home gardeners find Mullein too “weedy” and rip it out: it is the quintessential habitat plant though. Birds love it- it’s big enough to provide some shelter from predators and has seeds to eat in the fall, after a beautiful yellow parade of colorful cone shaped flowers pass by. The Yarrow (pictured on the right) is a fantastic butterfly habitat plant for Saratoga, and the Tri-County region. Yarrow is tough, drought tolerant and full of delicious nectar which attracts the butterflies in an uncanny way.